“What we’re doing is applying the law of the Lands Protection Act here and we’re going behind the corporate veil and seeing who are the owners of these corporations,” said Land, Communities and Environment Minister Richard Brown. The beneficial owners are one family basically! Finally, an official acknowledgement from the Liberal government that the Lands Protection Act never intended “one family” – regardless of the number of corporations those family members form – to accumulate more than 3,000 acres of arable land. In the case of the Brendel Farms applications, there were three such corporations: Indian River Farms, Long River Farms, and Galloway Farms (a new Irving-family owned corporation created 2 days before the applications to purchase Brendel Farms were submitted). The owners of those three corporations are Mary-Jean Irving and her two daughters, Rebecca and Elizabeth. But of course there are other well-known members of the Irving family, and other corporations. Given the fact that none of the 32 parcels were approved, it’s likely safe to assume that the “one family” [Irving] – with all their interlocking corporations – has already reached its land-holding limit of 3,000 arable acres. What wasn’t covered in the mainstream media regarding recent land applications by the Irving family is the decision Executive Council made on another Irving-owned corporation application for Land purchase decided on March 26, 2019…the same day the Premier called the election. Of course, Robert K. Irving also owns Cavendish Farms, which as a processing plant is apparently subject to the land holding limit stipulated in section 3 (5) of the Lands Protection Act, which places a five (5) acre aggregate land holding limit on industrial processing corporations. And Robert Irving – President of Cavendish Farms – a corporation which also operates through other Trade Named companies (e.g., Green Acres Produce and Poole’s Corner Potato Storage) – is also a co-owner of Island Holdings Ltd. I took a few hours today to see exactly how much land Island Holdings Ltd. has been allowed to acquire – research which was only made possible just a few months ago, when Scott MacKenzie, CEO of IRAC agreed to add a “name search” field, and a “current owner” field, on IRAC’s databank of land purchase & Lease applications – and I was shocked with what I discovered. First of all, since 1997, Island Holdings Ltd. made 198 applications to IRAC to acquire various-sized parcels of land, either by purchase or lease, and EVERY SINGLE ONE OF THOSE APPLICATIONS WERE APPROVED! I also did a search using “Island Holdings Ltd.” in the “current owner” field, to see if any parcels were ever sold to another corporation or non-resident [something that would have produced an IRAC record in the same databank], and NOT A SINGLE PARCEL OF LAND OWNED BY ISLAND HOLDINGS LTD. SHOWED UP IN THE SEARCH. There is the possibility that Island Holdings Ltd. sold land to an Island resident – such transactions would not have to be approved by Executive Council, and would not show up in the IRAC databank. 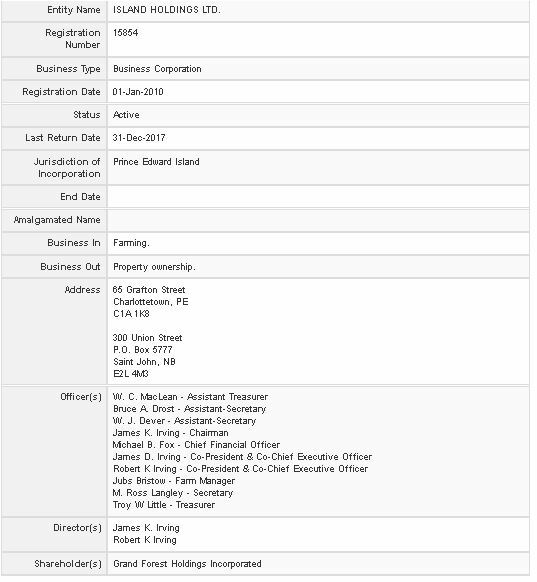 However, I highly doubt any land purchased by Island Holdings Ltd. was ever sold: the clear objective of Irving-owned companies, including Island Holdings Ltd., has consistently been to accumulate more land, not sell it. As well, it is not clear what percentage of Island Holdings Ltd. land holdings are arable or non-arable. However, again, the intention would clearly have been to acquire farmland for potato production for the french-fry plant, so one can assume that the lion’s share of the parcels were arable farmland. If there were any purchases of non-arable land (such as woodlots) it’s likely they have long-since been cleared and transformed into potato land. So exactly how much land did the 198 parcels acquired by Island Holdings Inc. add up to? Can someone within the Liberal government – preferably the Premier or Richard Brown – explain how a man owning a processing plant that’s supposed to be limited to 5 acres has somehow been allowed to amass this land simply by forming another company? Is Robert Irving not part of the Irving family? If Mary-Jean Irving and her two daughters were denied purchase of the Brendal Farm acreage because it was not in accordance with the Lands Protection Act, why was Robert Irving approved to purchase another 100 acres of land the very same day? And what’s the total now owned by all the Irving-owned corporations? Premier MacLauchlan – enough already with the deflection and subterfuge on this critically-important issue. And Minister Brown – you had absolutely no problem telling Islanders that the decision to turn down the Brendel Farms applications was not “politically-motivated,” but based on the recommendation of IRAC – so you disclosed what IRAC’s recommendation was in that case…..so can you also tell us what IRAC’s recommendation was on Robert Irving’s application to buy another 100 acres (via Island Holdings Ltd) which Executive Council approved the very same day? And while you’re at it – since Island Holdings Ltd. now appears to be 4,553.15 acres over the 3,000 corporate limit – can you also tell us how many of IRAC’s previous recommendations on Island Holdings Ltd. applications were overturned by Executive Council after they hit the 3,000 limit? It appears to be a blatant and shameless violation of the Lands Protection Act which the Liberal government has been keeping secret from Islanders and lying about for a very long time. I really hope I’ve made some grave miscalculation, or there’s some additional information I’ve overlooked on this one. I’d happily eat crow, and apologize for publicizing this information if it’s inaccurate. To be honest, I’d much rather have been in error than to have exposed such corruption and deceit by our own government! Can someone else reading this please take the time to double-check the database and recheck the math? Just type “Island Holdings Ltd.” in the search field of IRAC’s Land Application databank and you should get the same list I got. I’ve put the data I found in that databank into a chart, with columns for (a) the application date, and (b) the number of acres for each of the 198 parcels approved, in chronological order. I’ve also colour-coded the parcels in blocks to show which individual parcels had the same application date. You’ll have to enlarge the following chart to see the data more clearly. This entry was posted in Agriculture, Provincial Politics and tagged Cavendish Farms, Elizabeth Irving, Executive Council, Galloway Farms, Indian River Farms, IRAC, Island Regulatory and Appeals Commission, Long River Farms, Mary-Jean Irving, Rebecca Irving, Robert Irving. Bookmark the permalink. 5 Responses to Thanks to Premier MacLauchlan, It appears Robert Irving has Acquired over 7,5OO Acres of PEI Land! There seems to be no end to the deceit, corruption and lack of concern for misleading the electorate by this government. How anyone can support their continuance in public office is unfathomable. You guys are giving away PEI again! Look at our history of absentee landlords! You will sell us off for the love of the almighty buck and there will be not much land left for the islander!! If you check geolinc you can find the current properties owned by island holdings and it adds up to 3252.69 acres of all land types. What that means is the rest of the acreage (4,300.46 acres) was either acquired by lease (which still counts as land holdings) or some of it may have been subsequently transferred to other Irving-owned corporations; which unfortunately is something we can’t investigate to get a full and accurate picture of Irving land holdings because there is no “name search” in the Corporate/Business Registry, and there’s no way of knowing what other named or numbered companies may be registered and owned by the Irving family. There clearly needs to be a full investigation into this matter.